Jordan Point Lighthouse was built in 1855 on the James River near Hopewell, Virginia. 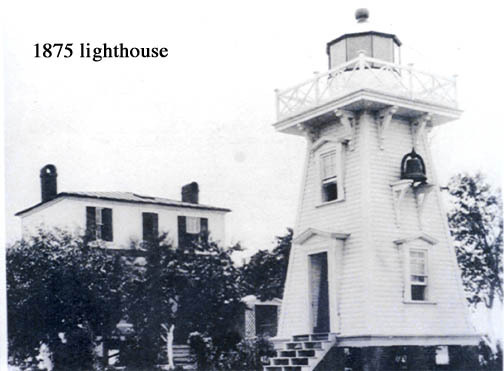 The first lighthouse was a white keeper’s quarters with a light on the red roof of the structure containing a pressed-glass masthead lens. The house was removed in 1875 due to shore erosion. A square pyramidal wooden bell tower was built and the lantern was placed at the top of the tower. This became the second lighthouse. In 1888 a new keeper’s quarters was built. The total cost of the tower and quarters were $3,449. With continued shore erosion, the house and surrounding property was sold in 1927. The building and property were abandoned in the 1930s. The current light was built in 1941 and is a steel skeleton tower that serves as the Jordan Point Range Rear Light.